It was time to man-up and spend an evening trying out a bevy of fruit beers for the July meeting. 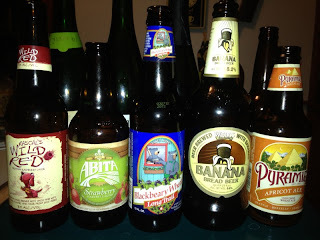 Hosted by Larry B. at his home, we had 14 different beers to sample and 13 people to do it. We started off the event with a homebrew from Cary K. His tangerine wit may have lost a bit of its fruit flavor i its time spent in the keg, but a nice refreshing summer beer nonetheless. Deciding to start with the lighter, sweeter beers first we opened up Wild Blue & Wild Red from Blue Dawg Brewery. We think it is a brewery that is run by Faygo as these 2 beers are soda pop sweet. The label is a bit confusing as depending of how you hold the bottle to read the label, it is either a lager or an ale. Either way it is an 8% soda beer. To follow the Wild Red raspberry, we opened Oaken Barrel's Razz Wheat. Very mild by comparison, it is more like an actual beer with raspberry undertones. Abita Strawberry was next. A nice aroma, but rather non-descript. Pyramid Apricot was well received. Very nice aroma, good carbonation, a good summertime ale, very refreshing. A couple of banana beers were next. Wells Banana Bread Beer was first. The beer that inspired Larry to give a banana beer a try earlier this year. The aroma a flavor are really like banana bread. 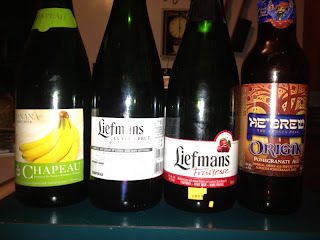 Chapeau Banana Lambic next was much sweeter and a bit cidery. The table was divided on which was the better of the two. Longtrail Blackbeary Wheat left us wondering where the blackberries were. A crystal clear wheat with just a faint bit of fruity aroma and not much fruit flavor. Hebrew Pomegranate is very malty and deemed to be close to Cary's Groaning ale albeit at a much lower ABV. 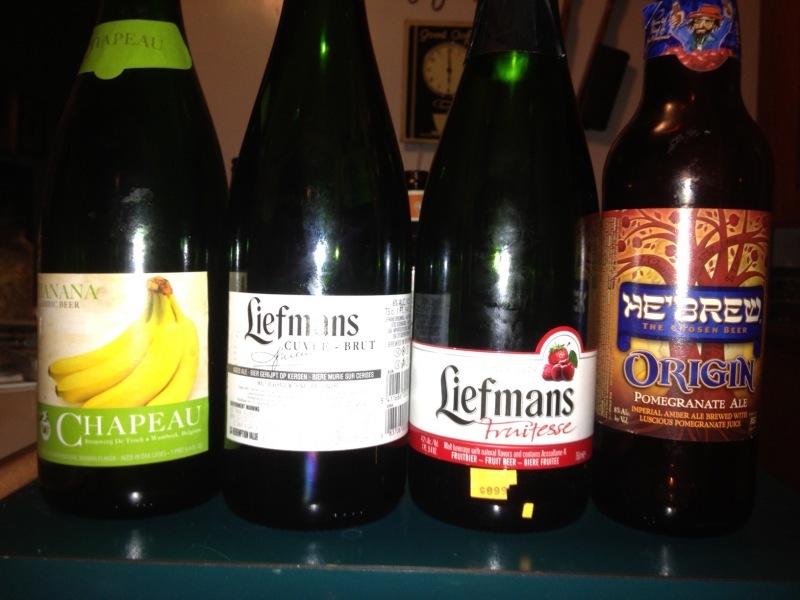 Liefmans Fruitesse is the lambrusco of lambics. By the label it looks as though it is a mix of all the other Liefmans lambics. Another very sweet beer. Feeling our manliness quickly slipping away from drinking all these sweet, fruity beers we turn to bigger beers in an effort to save our man-cards and not start swapping recipes and discussing wallpaper.Liefmans Flemish Brown is a blend of 3 different vintage browns and is quickly deemed the Best of Show. New Belgium had 2 Lips Of Faith offerings. Tart Lychee left us wondering what a lychee is supposed to taste like. It could have been right on the money, but we had no way of knowing. Super Cru with pear juice ended the list.